Unfortunately a family crisis forced Bradham to drop his pursuit in medicine and return home to North Carolina. Upon returning, he taught school for a short period of time before opening a drug store on the corner of Middle and Pollock Streets in downtown New Bern. Bradham’s Drug Store would later become the very place Pepsi-Cola was invented. In 1893, “Brad’s Drink,” made from a mix of sugar, water, caramel, lemon oil, nutmeg, and other natural additives, became an overnight sensation. 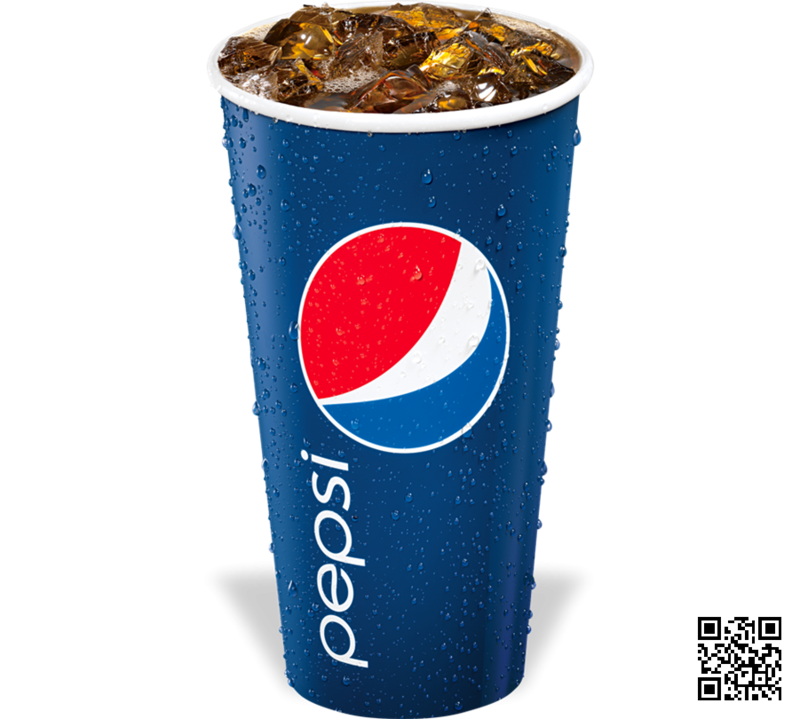 Despite its name and hearsay, pepsin was never an ingredient of Pepsi-Cola. 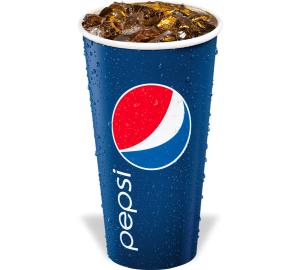 On August 28, 1898, Bradham renamed his drink “Pepsi-Cola.” He believed the drink was more than a refreshment but a “healthy” cola, aiding in digestion, getting its roots from the word dyspepsia, meaning indigestion. In late 1902, the Pepsi-Cola Company was formed due to the rising popularity and demand for the Pepsi-Cola Syrup with none other than Caleb Bradham as the first president. The business began to grow, and on June 16, 1903, “Pepsi-Cola” became an official trademark. By 1904, the Pepsi-Cola Syrup sales reached almost 20,000 gallons. As demand for the drink continued to rise, Bradham decided it was time to offer Pepsi-Cola in bottles. By 1910 there were 240 franchises in 24 states and that year the Pepsi-Cola Company held their first Bottler Convention in New Bern. Hard times fell on Bradham and the Pepsi-Cola franchise during WWI. This was due to the high price and severe rationing of sugar. This rationing prevented Pepsi-Cola from producing enough syrup to meet the demands of consumers. Though Bradham attempted multiple substitutes for sugar, like molasses, the outcome was always an inferior taste to the original. After the war ended sugar prices soared from 3 cents to 28 cents per pound. Bradham purchased a large quantity of the high priced sugar, which would be a factor to the company’s downfall. Pepsi Cola officially was bankrupt as of May 31,1923, and its assets were sold to Craven Holding Corporation for $30,000. After years of ups and downs, PepsiCo is now back on top. In 2013, Pepsi was ranked #1 on CoreBrand’s list of Most Respected Companies. The company was also ranked #41 on the Fortune 500 list, in 2012. 1898 – One of Caleb’s formulations, known as “Brad’s Drink,” a combination of carbonated water, sugar, vanilla, rare oils and cola nuts, is renamed “Pepsi-Cola” on August 28, 1898. 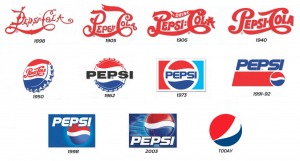 Pepsi-Cola receives its first logo. 1902 – The instant popularity of this new drink leads Bradham to devote all of his energy to developing Pepsi-Cola into a full-fledged business. He applies for a trademark with the U.S. Patent Office, Washington D.C., and forms the first Pepsi-Cola Company. 1903 – “Doc” Bradham moves the bottling of Pepsi-Cola from his drugstore into a rented warehouse; he sells 7,968 gallons of syrup in the first year of operation. 1904 – Bradham purchases a building in New Bern known as the “Bishop Factory” for $5,000 and moves all bottling and syrup operations to this location. Pepsi is sold in six-ounce bottles. Sales increase to 19,848 gallons. 1905 – Pepsi-Cola’s first bottling franchises are established in Charlotte and Durham, North Carolina. 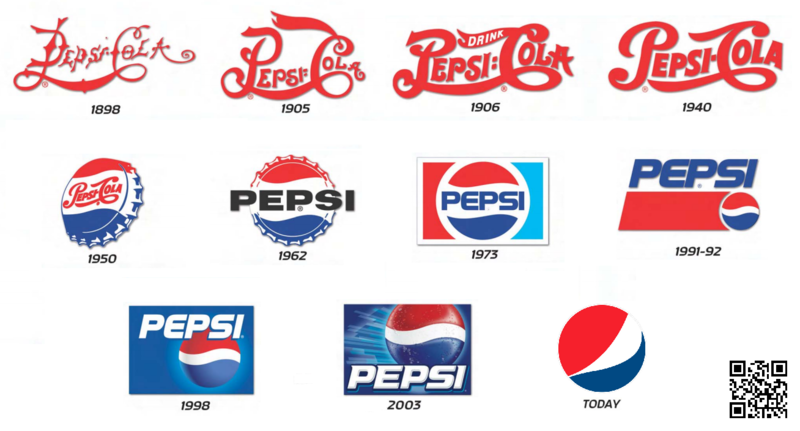 1907 – Pepsi-Cola Company continues to expand; the company’s bottling network grows to 40 franchises. Pepsi-Cola sells more than 100,000 gallons of syrup. 1908 – Pepsi-Cola becomes one of the first companies to modernize delivery from horse drawn carts to motor vehicles. Two hundred fifty bottlers in 24 states are under contract to make and sell Pepsi-Cola. 1910 – The first Pepsi-Cola bottlers’ convention is held in New Bern, North Carolina.